Thanks to rendering artists, we already know what the continental GTC will look like. It's been just a few days since the reveal of the new Bentley Continental GT. The car features new design cues that were borrowed from the gorgeous EXP 10 Speed 6 Concept, which stole the Geneva show when it was revealed back in 2015, but Bentley came out with an even more stunning convertible EV version of the car called the EXP 12 Speed 6e. 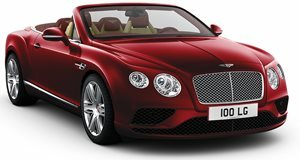 Even though the all-new Continental GT has only been revealed as a coupe, we know that a convertible model will be on its way soon. Luckily, Spdesignsest has already made a rendering of what the GTC will look like. This rendering artist has done a great job envisioning the new Continental GTC. We doubt that the final car will be a two seater like the rendering, and will most likely feature a couple of rear seats. Even if this is not what the real car will look like, we think that this rendering gives us a good idea of how good the new Continental GT will look like as a drop top. In our opinion, the convertible is even better looking than the coupe. The Continental GT is rumored to hit dealerships near the Summer of 2018, and the GTC will be available closer to the end of the year. We also can't wait to see what else Bentley has in store with the new car's engines. So far, the only engine option is a 6.0-liter 626 hp twin-turbo W12 that is mated to a new eight-speed dual-clutch. We have no doubt that faster Speed and SS models will be available at some point, and there will likely be a smaller V8 version and possibly a hybrid model. This new Continental will be a very important car for Bentley, and we can't wait to see what else the company has up its sleeve.